Gone to See North America Road Trip. Day 22: Anchorage to Burwash Landing on the Alaska-Canada Highway. Yukon, Canada. Derelict Fishing Boat . Upon completion of ANPAT 9, I started my return trip from Anchorage Alaska through Canada along the Alaska-Canada (ALCAN) highway. The first night I stopped at a RV park in Burwash Landing, Yukon Canada. The RV park is right on the bank of Kluane Lake. 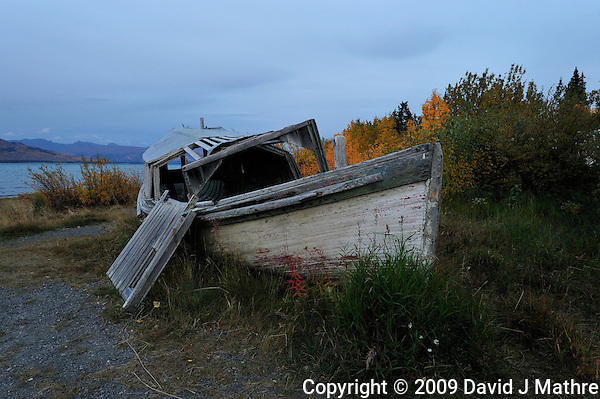 I noticed this derelict fishing boat right behind my RV, and thought that it looked interesting. It was overcast, and starting to get dark so I bracketed the exposures. I processed the images with Photomatix Pro, and pushed the saturation to get a colorful autumn look. Even though this may be considered by some as a “highly distorted reality” HDR, I like the effect for this image. I have also included an unprocessed single exposure version for comparison. 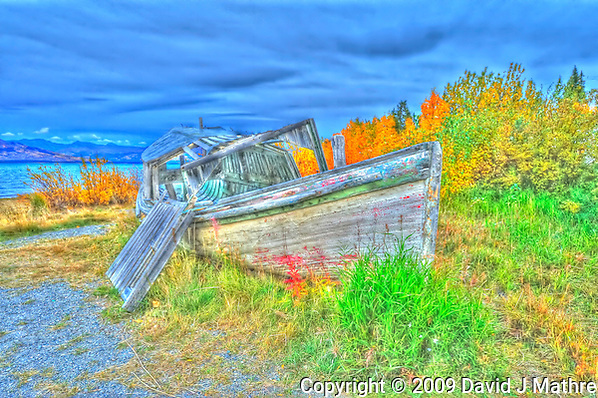 Intersting note if you search the net for images in and around Burwash Landing and Lake Kluane you will find many images of this boat, and see how it has decayed over the years.